* Green/Eco Friendly/Environmentally Responsible ~ Made of 100% USA recycled Steel ~ Manufactured in 100% in America. * Elegant, durable, baked on Black Satin Powdercoat Finish. * A gorgeous way to decorated your vanity, dresser, makeup area or a shelf using your own jewelry collections. * Wonderful for home, retail or commercial use. Jewelry collections can be quite an investment, why not display them as art and keep them up and out of harms way and tangle free? Perfect for jewelery exhibition, so what you waiting for? 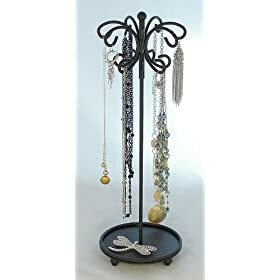 They said this necklace stand fabulously designed necklace tree has fourteen scrolls for your pendant and necklace collection. It has a serves as an accessory tray for rings, weighted base etc. This pendant necklace tree is a spinner so you don’t need to reach the back, just turn the top. Perfect for home retail jewelry shop. Black Akoya pearls are beautiful, and they do come from oysters, often from Pinctada Fucata Martensii, but they are not naturally black. Tahitian pearls from the Black Lipped Oyster (Pinctada Margaritifera Cumingi) emerge from the oyster with their natural dark color, but Akoya pearls are color treated to achieve that deep beautiful color.